Oven Roasted Zucchini Salad is a fresh way to serve zucchini. 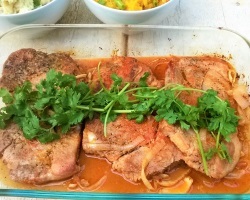 I made this zucchini dish as a side to Paprika Lime Pork Chops and the two flavors complemented each other perfectly. Place sliced zucchinis on greased pan in a single layer. Place zucchinis in oven and bake for 15 to 20 minutes or until tender to a fork. Remove zucchini from heat and add cider vinegar. Adjust for salt to taste.